Free download talkSPORT Clash of the Titans game for PC. It is very simple and very interesting game developed by MDickie. talkSPORT Clash of the Titans game is availabe for PC free. It is very easy to play on your PC. This game is very light weight and very easy to install and run on your computer system. You can download talkSPORT Clash of the Titans game easily from this website. To download the game, just click on the download link given below. After downloading, just run the setup to install this game on your computer system. This game requires only 16 MB free space on your hard disk. The installation process will take few seconds and then you are ready to play. talkSPORT Clash of the Titans game main menu has only three menus, play, options and exit. From the options menu, you can change screen resolution and CPU Level from very easy to very hard. When you click on Play button, you have to select the player. You will see four players named Ian Collins, James, Mike and Ion. 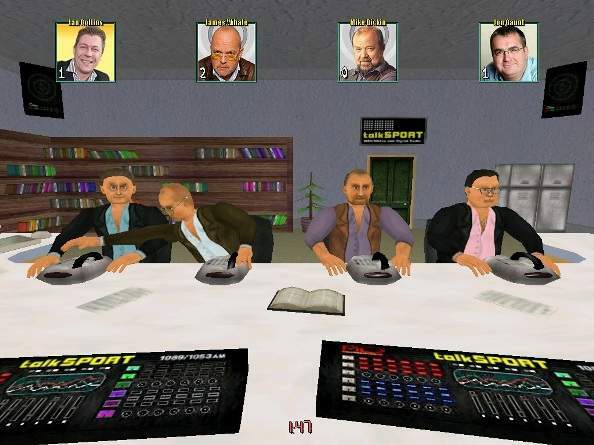 In these players, three are computer and one is cursors. You have to select cursors with arrow keys symbols. If you select any other than cursors, you cannot play the game. When the game starts, you will see all the four players sitting before telephones. You have to pick up as many calls as you can. There is the time about 2 minutes and you have to attend as many calls as you can. You can make busy your left and right hand side player by punching him. Using left and right arrow key, your player will hit. If there is a call, you can also pick up the phone of your left and right ones. By pressing left arrow key, your player will hit a punch and if there is a call, he will pick up it. If there is call on your phone, you can pick it by pressing down arrow key. Down arrow key will also use to safe yourself from the attack of your neighbors.